to remove layer upon layer of polish, I discovered a few things about myself. And for the moms reading this, I bet these ring true to you, too. Number 1 – I absolutely enjoy being pampered. Mom life does not allow for this much, outside of Mother’s Day. Number 2 – I really need to stop reapplying nail polish without removing the past coat(s). It wreaks havoc with my “put together” persona and causes me nail salon shame. Number 3 – I need to be able to experience more days doing something strictly for myself. I used to think this was selfish, but everyone needs a little alone time, and self-care is always necessary. If you’re nodding along, here’s how you can take better care of yourself: Choose at least one day every few weeks that is strictly yours. If you like to read and drink coffee, go read and drink coffee. If you like being pampered, schedule yourself a spa day, including a pedicure. Keep this date, and if life happens, don’t cancel – just reschedule. Take care of your toes. When you are in a hurry and see that a few of your toenails need to be redone, take 15 minutes and do the job right. Unless, however, you need just one swipe on your big toe… Marlena Rice is a busy mom and writer who lives in Tuscaloosa with her husband, Rod, and their son, Beaux William. Check out her blog at heartfullybuilt.com. Photos by Marlena Rice. CONNECTING WITH TEENAGERS TAKES EFFORT. WHETHER YOU’RE THE ANNOYING YOUNGER SISTER, OR THE PARENT, YOU HAVE TO FIND TIME TO SPEND WITH TEENAGERS ON THEIR TERMS. you’re not in a rush to do anything. Being a part of Youth for Christ, we spend a lot of time creating environments where all kinds of teenagers feel welcome. We are very intentional about the music, the schedule, and even the locations of where we gather students. As parents, we must be just as intentional with our own children, so stock up on snacks, download the latest emoji’s, and find your old alarm clock! My daughter has gone to the same camp five years now. In the words of my practical CPA husband, the expense is “ridiculous.” This year, we said, “Pick anywhere instead of camp, and we will take a trip.” She chose Seattle, Washington – the farthest in the U.S. from Alabama she could pick. We booked our flight (hooray for frequent flyer miles). We booked one hotel ahead of time. We used Airbnb a lot, including to book a rooftop condo in Seattle for less than the cost of a hotel room. For two weeks, we traveled from Seattle down the coast of California with nothing but GPS (coastal Highway 101 and Hwy 1), using online booking sites along the way in tiny towns as we made our way to California. We hugged the coast and ventured through an actual Redwood tree (in the rental SUV) and through miles of forest that made us realize how insignificant we really are. I hung out the window snapping pics as Chad drove, pulling off at random cliffs to snack on local cheeses and picnicking on fresh caught crab boiled in a pot right in front of us at a marina on Rockaway Beach. Chad played golf at Bandon Dunes, where I walked a labyrinth in memory of a friend’s daughter who had gone to Seattle for a cure for cancer when I was a kid. Mike Hale says, driving “intexticated.” It could also be one, if not a combination of: Facebooking, Snapchatting, GPS’ing, liking, following, sharing, eating, drinking, videoing, holding an animal, or seeing how long you can close your eyes before hitting something and driving. The truth is, we just need to be… driving. One morning, I got stuck behind a lady who wss multi-tasking (which is about the nicest way I can put it). To her credit, she was driving under the speed limit: 30 mph in a 55 mph zone which was, of course, driving me insane. But the most impressive detail about this encounter was the fact that she was scrolling through her phone with one hand while applying mascara with the other – as the sun visor mirror blocked her view of the road and a small dog jumped around in her lap. Now, I’m no DD expert, but I’m pretty sure this meets the criteria. While the feat itself was impressive, her reaction time would have spelled certain doom for anyone involved, not to mention her dog, her phone, and those poor eyelashes. So, before you go speeding and scrolling, please, take a minute to think about your own welfare, but also the safety of the mom in front of you with two small children in the back. Or the elderly couple just out to get some coffee. Or that guy on the motorcycle who has nothing protecting him. If it’s an emergency, chances are you will get a phone call… not a text. Everything else can wait. Need more clients? Donâ&#x20AC;&#x2122;t have time to do marketing? Business owners wear a lot of hats. Accountant, HR and marketing - not to mention your core business. Outsourcing to experts saves you time AND you get better results. 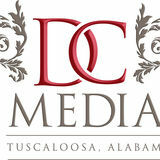 Druid City Media is local. We know Tuscaloosa. We also know digital marketing. We can help you maximize your budget - both your time and marketing budget. the newly-constructed business incubator and accelerator known as The Edge, where it will house its new Center for AI and Machine Learning. 3 The Capstone Freight, LLC team was the overall winner of the 28th Annual Nucor Steel Tuscaloosa Adopt-A-School golf tournament, held on Sept. 6 at Ol’ Colony Golf Complex. The team won $500 for their adopted school, Hillcrest High School. 7 The University of Alabama School of Law will become the Hugh F. Culverhouse Jr. School of Law, after a $26.5 million donation from prominent business executive and attorney Hugh F. Culverhouse Jr. The gift is the largest in school history. Culverhouse has, along with his wife, Eliza, now cumulatively committed more than $35 million to UA over the past decade. 3 Krystal celebrated its recent reopening with a special ribbon cutting at its Tuscaloosa restaurant (3710 McFarland Blvd. E) on Sept. 13. (205) 556-4733; krystal.com 4 Selma’s Mark’s Mart plans to open in Northport (2300 5th St.) soon. Mark’s Mart is a specialty grocery store featuring cut-to-order meats, and more. 6 Gene “Poodgie” Poole was given the Leroy McAbee Sr. Distinguished Service Award on Aug. 27, during a reception at the oﬃces of Tuscaloosa Tourism & Sports as part of the organization’s Fifth Annual Alabama Veteran’s Reunion. The award is presented to honor a veteran of the U.S. military who has continued to serve his/her community through philanthropic and/or volunteerism to enhance both the community and the citizens within it. 4 DCH Regional Medical Center has been named a High Performing Hospital in Chronic Obstructive Pulmonary Disease and Heart Failure by U.S. News & World Report in its annual health ratings edition. A hospital must score in the top 20 percent nationwide for a particular medical specialty, procedure, or condition to earn the rating. 5 Shelton State Community College held a grand opening for its new Child Development Demonstration Suite, located on the C.A. Fredd Campus. The suite will provide SSCC Child Development students with hands-on experience in a real-life environment and allow opportunities for observation and instruction. Caring. For Life. with the latest technology. DCH Regional Medical Center is the first hospital in central Alabama to offer the UroNav Fusion Biopsy System for the detection and diagnosis of prostate abnormalities. UroNav fuses pre-biopsy magnetic resonance images of the prostate with ultrasound-guided images gathered in real time during the biopsy to give your doctor the clearest, most accurate information for diagnosis. This technology can help detect lesions sooner and reduce the number of tissue samples needed, which can reduce the risk of infection, bleeding, pain and recovery time. UroNav is available thanks to funds generously provided by The DCH Foundation. Birthday Party & Corporate Party Packages Starting at $150 Email icerinkinfo@tuscaloosa.com to book today. By Faith Henley It’s that time of year again - time for ghosts, goblins, witches, and plenty of treats. Halloween in Tuscaloosa is always a busy time, and this year is no exception. If you’re looking for some spooky fun, here’s a round-up of some of the best our area has to offer. On Oct. 21, Government Plaza will be taken over by witches flying around on their “broomcycles.” Hosted by The Arc of Tuscaloosa County, the Black Cat Block Party will follow the inaugural T-Town Witches Ride, with entertainment, activities for kids, and costume prizes. Families are encouraged to set up on the sidewalks, where they’ll have a great view of the witches as they complete their ride. Proceeds raised at this event support the programs of The Arc of Tuscaloosa County who provides support and resources to hundreds of people in Tuscaloosa County with intellectual and developmental disabilities. Through education and training, The Arc helps adults with these disabilities live happy, independent lives. The event begins at 5:30 p.m. Participants older than 18 can sign up for the one and a half mile witches’ ride for $25. Bicycle rentals are available. The block party is free and open to the community. To register, visit thearcoftuscaloosa. org. The Women of UA’s Greek community will host their annual Halloween trick-or-treating event on Oct. 30 beginning at 6 p.m. Children can safely roam Colonial, Magnolia, and Judy Bonner Drives, where members of Alabama Panhellenic Association, the National Pan-Hellenic Council, and the United Greek Council will be passing out treats on the front lawns of sorority houses. “We really enjoy putting on Trickor-Treat on Sorority Row, because it’s a great chance for the Greek community to interact with the Tuscaloosa community,” said Candace Wilson, director of community development and outreach for the Alabama Panhellenic Association. “Everyone enjoys the event so much, and we look forward to having it every year.” This event is open and free for children under 12. Participants are encouraged to wear their best costumes, but masks should be avoided for safety purposes. A truly unique Tuscaloosa event, Haunted Tuscaloosa Tours has returned this year. Beginning and ending at the historic Drish House, visitors on a 35-seat vintage trolley bus will tour around 16 haunted locations across Tuscaloosa while learning about the locations’ spooky histories. Locations on the tour include the Bama Theatre, The Jemison-Van de Graaff Mansion, The University Club, the Amelia Gayle Gorgas Library, and Capitol Park. “The stories are about Tuscaloosa’s history, albeit a haunted history,” said Laura Lineberry, a team member with Tuscaloosa Paranormal Research Group. “Tour participants not only get to hear about the haunted side of some of our city’s landmarks, but they receive a summarized history of the structure, land, and even the people who lived or worked in those places. We have a good time sharing the stories and teaching our groups a little bit about ghost hunting.” Tours are given every Friday night through Oct.26. Each tour lasts approximately 90 minutes. Tickets cost $25, and discounts are given to seniors, students, and children ages 8 to 12. Children under age 8 will not be permitted. After the last tour of the night, “The investigations that follow the 10:00 p.m. tours are always different,” Lineberry said. “You never know what you’re going to get. From disembodied voices and giggles from unknown spirits to doors opening and closing on their own, every investigation is likely to come with a surprise or two.” For tour times and tickets, visit hauntedtuscaloosatours.com. will be set up with games, crafts, live insect displays, and even some “mad science” experiments. Attendees will learn about the history of Tuscaloosa from character performers and storytellers, and they’ll be able to take guided historic tours of campus and The Gorgas House Museum. The City of Tuscaloosa’s third annual Tech-or-Treat Night is planned for Tuesday, Oct. 23 from 6 to 8 p.m. at the Tuscaloosa Gateway Innovation and Discovery Center. Open to all members of the community, this event is similar to trunk-or-treating, where children go from trunk to trunk to collect candy, typically in school or church parking lots. The tech-or-treat event will feature City departments and various community organizations passing out candy to guests in costume. Along with candy, guests can also receive tech-related items, from cell phone accessories to digital storage devices. Michelle Smart, the community engagement manager for the City of Tuscaloosa, says Tech-or-Treat at Gateway is a great way to spotlight STEM opportunities for area young people. “The Gateway provides a technology resource that many of our citizens may not be aware of, and we love hosting them at this location for a family-friendly, free event.” Local businesses or organizations that would like to host a tech-themed table can contact events@tuscaloosa.com. a lot of my wife’s time, because she travels with me.” He proposed to his wife, Ashley, on the show. She is a big part of his support team, along with fan favorite “Grandaddy” (Emmit Pitts of Tuscaloosa), who has also been on the show to support Suchocki. “Grandaddy built an obstacle course for me in the backyard. He more or less raised me. The people on the show love him.” His wife, his grandfather, and his work team have been a part of Suchocki’s success. He works for The Builder’s Group – a local construction firm. “There are a lot of companies that wouldn’t approve of this, but Builders Group has allowed me to go miss a few weeks of work to compete. They have worked to help me balance. This just goes to show how Builder’s Group is supportive of their employees and their customers. Very family oriented,” Suchocki said. “If you are going to do something, you do it all out, and I am like that about my job too. Not only do I work at Builder’s Group, but I coach the owner’s nephews through my training group at my gym where they learn to compete as American Ninjas.” When asked what he thought of his performance, Suchocki doesn’t mince words. Top: Joe Sewell played for the Cleveland Indians when they won the World Series in 1920. Image courtesy of the Library of Congress Right: Joe Sewell’s Hall of Fame Plaque. He was inducted in 1977. Image courtesy of the Baseball Hall of Fame, Cooperstown, NY. Memorial Park. About the Author Jim Ezell is a retired engineer, historian, and author. His newest novel, The Cistern, was published in Dec. 2017. The Cistern is an adventure/ crime novel set in Tuscaloosa and fictional Tombigbee County in the Alabama Black Belt. The Cistern is available on Amazon.com. I usually play it safe when it comes to decorating my home, but every now and then, I see inspiring ideas that make me wander off the beaten path and try something a touch out of the ordinary. The basket wall in our breakfast room came about in just this way. Hi there! I’m Kathryn from the blog Woodbank Lane, and here’s an easy, inexpensive, and interesting alternative to pictures or mirrors for your walls – baskets. I’ve seen baskets used in many ways as wall décor on Instagram, Pinterest, and in magazines. They are a great way to add texture, a natural element, and character to any space. They work wonderfully well in large areas, like over a bed’s headboard or over a buffet, but they can also finish off the space over a mantel or an odd wall in a room. In addition, baskets can contribute beautifully to completing the look around televisions that now often sit on cabinets and chests in family/living rooms. When I started hunting for baskets that might work in a gallery wall at thrift stores and antique malls, I kept in mind they needed to be all different sizes and depths to pull off the look I was hoping for, and to make the display interesting. Choosing them was the easy and inexpensive part. I even caught several 50 percent off – most of them start at only a few dollars. How could I go wrong?! But deciding how to arrange them once I had them all collected, that was a bit trickier. I laid them out in tons of different ways on the floor. I tried mixing them with plates, too. At first, I thought symmetry was the way to go. In most decorating projects, symmetry is my first love. But most of my inspiration pictures had the baskets hung in somewhat random, off-center arrangements. Those are the ones that spoke to me. So, after agonizing over how to get started, I finally just hung one of the bigger baskets high and to the left. I kept adding them, one at a time, until the wall had my desired look. I used straight pins to hang them. If I had to adjust a time or two, it wasn’t a big deal. NO nail holes = happy husband. Tuscaloosa native Kathryn Wilkerson is a wife, mom of three, a teacher, and the author of Woodbank Lane – a blog that oﬀers up a variety of diﬀerent decorating ideas and projects, recipes, and inspiration for living. Follow Kathryn at woodbanklane.com and on Instagram @woodbanklane. Left: A Day on the Courts is set for Tuesday, Oct. 9 at the Indian Hills Country Club Tennis Facility. Right: The DCH Foundation’s Drive 4 the Cause Golf Classic is set for Friday, Oct. 12.
purchase tickets to any of the Play Pink DCH Foundation events, visit dchplaypink.com or visit The DCH Foundation on Facebook. purchase is required to participate. Booths featuring local artists and their wares for sale will be an additional feature of the event. Artist booth details are available by visiting www.tcpara. org/oktoberfest and clicking on the artist application button. A $10 entrance fee gains attendees’ entrance to the event and a stein. Children, ages 12 and under and accompanied by a ticketed adult, are admitted free. Authentic German beer, sausages, and pretzels and more 3o1 fare will be available for purchase. Playground designers indicate this will be the largest inclusive playground in the southeast. According to PARA officials, “This will be the coolest, most unique playground around. Unique in that children with disabilities and typical children can play together and cool in its design and features.” PARA, 3o1 Bistro, and event sponsors encourage everyone to come out and be a part of the first Tuskaloosa Oktoberfest to benefit the Tuscaloosa All-Inclusive Playground. Prost! Fall is most certainly in the air now, and on that note, I thought I’d give y’all one of my favorite Italian recipes – one that everyone should love. And to finish off a great dinner at home? How about a blueberry lemon cake? Have a great October, everyone, and as always, Bon Appetit! Stir in pasta and basil (reserve a bit for garnish). Toss to combine. Serve immediately. Cook pasta according to directions, drain. In a large skillet (regular not nonstick), heat oil over medium high, cook and crumble sausage until brown. BLUEBERRY LEMON CAKE • 2 large eggs • 1 1/2 cups sugar • 1 cup sour cream • 1/2 cup vegetable oil • 1 teaspoon vanilla extract • 1/4 teaspoon salt • 2 cups all-purpose flour • 2 teaspoons baking powder • The zest of one medium lemon, divided • The juice of one medium lemon, divided • 1/2 Tablespoons corn starch • 16 oz fresh blueberries • Powdered sugar Preheat oven to 375 degrees. Grease or butter a 9-inch spring form pan and line it with parchment paper. Add wine, deglaze pan (scrape brown bits off bottom of pan) and cook until reduced by half. In a stand mixer with a whisk attachment, beat the eggs and sugar on high for 5 minutes until fluffy. Add in the sour cream, oil, vanilla, and salt. Whisk on low until combined. Add cream, mustard, red pepper. Simmer for 2 minutes. Amy Poore is a Tuscaloosa mom, wife, and foodie. To see more of Amy’s delicious recipes, visit her blog, Poore Amy, at pooreamy. com. Photos by Amy Poore. In a bowl, combine the flour and baking powder then slowly add to the batter in 3 increments, whisking to combine with each addition. Be careful to not overtax. Add in 1 Tablespoon of lemon juice and 1/2 Tablespoon lemon zest. In a medium bowl, toss the blueberries with 1/2 Tablespoon of cornstarch and 1 teaspoon lemon juice. Combine until the cornstarch is completely dissolved. Pour half of the batter into the pan and spread evenly. Evenly place 1/2 of the blueberries on top. Top with the rest of the batter and repeat with the remaining blueberries, slightly pushing them into the batter. Bake for 50-60 minutes until a toothpick comes out clean. Let rest in the pan for 15 mins then remove ring to finish cooling. Dust with powdered sugar. A great day starts with a great breakfast. Fluffy, delicious pancakes, country potatoes, and mouthwatering bacon make a trip to the Waysider a Tuscaloosa tradition. Donned in Alabama memorabilia and nostalgic décor of the Crimson Tide’s most famous characters, out-of-town guests will thank you for bringing them to The Waysider. By Sheena Gregg It’s football season, and that means two things: it’s time to Roll with the Tide in BDS – and it’s time to eat! Whether you’re a hungry out-oftowner or a local, everyone can agree that Tuscaloosa offers up some of the best game day eats around. Here are some of my favorite suggestions for places to grab a bite – before or after the game. RTR! If you’re looking for something right on The Strip, Big Bad Wolves BBQ, next to The Houndstooth, will give you the game day experience you’ve been looking for. Massive BBQ nachos will make your time in line worth the wait – and get the extra cheese and peppers, because it’s game day. Italian cuisine may not scream football season, but it does scream delicious. Made from scratch pastas and signature dishes complement the cozy yet upscale space for lunch or dinner on your game day weekend. If you’ve got room for dessert, don’t forget to order the white chocolate bread pudding. With menu items like the “17 National Champs BLT,” the “Ain’t Nothing But a Winner Polish Dog,” and the “Touchdown Burger Platter,” how could you not want to stop here before the game? Located conveniently right beside Bryant-Denny Stadium, Rama Jama’s is a people pleaser for locals and out-of-towners alike. Top Left: The Avenue Pub oﬀers great pub fare, including outstanding hamburgers, in downtown Tuscaloosa. Photo by Sheena Gregg. Top Right: Big Bad Wolves serves up some of the best game day BBQ around. Photo by Big Bad Wolves. Bottom Left: The white chocolate bread pudding at DePalma’s is a delight and a must have. Photo by Sheena Gregg. Bottom Right: Rama Jama’s is a Tuscaloosa landmark, located right next to Bryant-Denny Stadium. Photo by Sheena Gregg. Haunted Tuscaloosa Tours: Through Oct. 26. The Historic Drish House. For more information, including specific tours, times, and more, visit hauntedtuscaloosatours.com. Junior League of Tuscaloosa’s “Dinner at Your Door”: Oct. 4. Enjoy a delicious dinner for four for just $50. For more information, visit jltuscaloosa.org. Bama Art House Film Series Fall 2018 Presents the “Manhattan Short Film Festival”: Oct. 2, 7:30 p.m. Bama Theatre, downtown Tuscaloosa. Tickets: $8 general, $7 for students and seniors, $6 for Arts Council members. Box office opens at 6:30 p.m. For more information, visit bamatheatre.org. Kentuck Art Night in Downtown Northport: Oct. 4, 5-8 p.m. This monthly celebration of art and artists is free to the public. Enjoy live music, pop-up shops from local vendors, demonstrations by Kentuck studio artists, and more. For more information, visit kentuck.org/art-night. Theatre Tuscaloosa SecondStage Presents “Love, Loss and What I Wore”: Oct. 2-6, Green Bar, Tuscaloosa. Nora and Delia Ephron’s tapestry of monologues comes to life in this show. For show times and more information, call 205-3912277 or visit theatretusc.com. 30th Annual Moundville Native American Festival: Oct. 3-6, Moundville Archaeological Park. Performers, artists, craftspeople, and tradition bearers are on hand to educate festival-goers about the rich culture and heritage that makes Southeastern Indians unique. Includes living historians, arts and crafts, and a children’s area. For more information, visit Moundville.ua.edu. Northport Citizen of the Year Awards Luncheon: Oct. 4, 11:30 a.m.-1 p.m. Five Points Baptist Church, Northport. For over 40 years, the Northport Citizen of the Year Awards program has celebrated outstanding leadership in the city. This year’s guest speaker is UA Head Softball Coach Patrick Murphy. For more information, email carolyn@tuscaloosachamber.com. Cole Swindell and Dustin Lynch with Lauren Alaina: Oct. 4, 7:15 p.m. Tuscaloosa Amphitheater. For more information, visit Ticketmaster. com, call the Tuscaloosa Amphitheater Box Office at (205) 248-5280 or charge by phone at (800) 745-3000. The ACT Presents “Of Mice and Men”: Oct. 5-14. The Actor’s Charitable Theatre Studio (2205 9th Avenue, Northport). For tickets, call (205) 393-2800 or visit theactonline.com. Somethin’ Pumpkin at CHOM: Oct. 6, 9 a.m.-4:30 p.m. Children’s Hands-On Museum of Tuscaloosa (C.H.O.M. ), downtown Tuscaloosa. Enjoy pumpkin chunkin’, hopping corn science, paper bag scarecrows, and paint your own pumpkin. All activities included in admission. For more information, visit chomonline.org. Miracle League of Tuscaloosa Hawaiian Day: Oct. 6 (games begin at 9 a.m.). LeeAnna Grace Cunningham Field, Sokol Park North. Players will experience a Hawaiian-themed atmosphere for opening day. For more information, visit miracleleagueoftuscaloosa.com. Tuscaloosa Oktoberfest: Oct. 6, Noon-6 p.m. 301 Bistro, Bar, and Beer Garden, downtown Tuscaloosa. This fun-filled food and beer festival benefits the Tuscaloosa All-Inclusive Playground Project. Events include a stein hoisting competition and a Dachshund Dash. Enjoy German beer and food, local artists, and live music. For more information, visit Tuscaloosa Oktoberfest on Facebook. Out of the Darkness Walk: Oct. 7, 2 p.m. (registration begins at 1 p.m.). Ferguson Center Plaza, University of Alabama campus. UA’s Counseling Center is hosting this walk to honor those who struggle and those lost to suicide. Out of the Darkness walks are the American Foundation for Suicide Prevention’s biggest fundraisers. For more information, visit afsp.org/Tuscaloosa. First Annual Downtown Chili Cook-Oﬀ: Oct. 7, 2-6 p.m. Downtown Tuscaloosa Entertainment District (enter at the corner of University Blvd and 23rd Avenue). This inaugural street festival features great chili from 30+ downtown Tuscaloosa restaurants and bars, and live music with Plato Jones. Entry fee: $10 (free for 12 and under). For more information, and tickets, visit downtownchilicookoff.com. DCH Foundation Play Pink – “A Day on the Courts”: Oct. 9, 8 a.m.-3 p.m. Indian Hills Country Club. For more information about this women’s doubles tennis mixer, call (205) 759-7349 or visit dchplaypink.com. Chamber Business After Hours: Oct. 9, 5-7 p.m. Home 2 Suites by Hilton, Tuscaloosa. For more information, visit tuscaloosachamber.com. Odesza with Jai Wolf and Evan Giia: Oct. 9, 7 p.m. Tuscaloosa Amphitheater. For more information, visit Ticketmaster.com, call the Tuscaloosa Amphitheater Box Office at (205) 248-5280 or charge by phone at (800) 745-3000. DCH Foundation Play Pink - A Night on the Green: Oct. 11, 6-10 p.m. Bryant Conference Center. For tickets, call (205) 759-7349 or visit dchplaypink.com. Youth for Christ Tuscaloosa Pumpkin Patch: Oct. 12-31, 10 a.m.-7 p.m. (M-Sat); 11 a.m.-7 p.m. (Sunday). 1401 McFarland Blvd. N. All proceeds from this event benefit YFC’s Camp Scholarship Fund. For more information, visit tuscaloosayfc.org. DCH Foundation Play Pink – Drive 4 the Cause Golf Classic: Oct. 12, Indian Hills Country Club. To register, call (205) 759-7349 or visit dchplaypink.com. The Black Jacket Symphony Presents Tom Petty and the Heartbreakers’ “Damn the Torpedoes”: Oct. 12, 8 p.m. (doors open at 7 p.m.), Bama Theatre, downtown Tuscaloosa. Tickets ($25 and $30) are available by calling 877-9876487 or at ticketfly.com. Creepy Science at CHOM: Oct. 13, 9 a.m.-4:30 p.m. Children’s Hands-On Museum of Tuscaloosa (C.H.O.M. ), downtown Tuscaloosa. See vanishing ghosts, make Jack-O-Lantern volcanos, and more. All activities included in admission. For more information, visit chomonline.org. Samantha Trade Day, Tractor Show, and Fish Fry: Oct. 13, 9 a.m.-2 p.m. Shepherd Hill, Samantha (13222 Fondren Road). For more information about this free event, visit goodshepherdfound.org. Calico Street Troupe Performance: Oct. 13 and 27, 10:30 a.m.-Noon, Northport Civic Center. Bring the whole family to this free, interactive, professional stage play for kids and their families, which features costumed actors, dancers, special lighting, and music – all on a 36-foot stage. Performances teach right choices and good character. For more information, visit calicostreet.com. Druid City Pride Festival: Oct. 14, 2-6 p.m. Government Plaza, downtown Tuscaloosa. Celebrate West Alabama’s LGBTQ+ community and allies. The headliner for the festival is actor/comedian Lady Bunny, and the lineup also includes musicians, vendors, and a children’s area. Pets are also welcome. For more information, visit druidcitypride.org. Toys for Tots Applications: Oct. 15-19. McDonald Hughes Activity Center (PARA), Tuscaloosa. Members and friends of the Alabama Marines Foundation will accept Christmas toy applications Oct. 15-19 from 10 a.m. to Noon, and Oct. 16 from 5 to 7 p.m. Families with children ages 0-12 years are welcome to apply. Parents should bring their photo ID and social security card, as well as a birth certificate and social security card for each child. Bama Art House Films Presents “Disobedience”: Oct. 16, 7:30 p.m. Tickets: $8 general, $7 for students and seniors, $6 for Arts Council members. Box office opens at 6:30 p.m. For more information, visit bamatheatre.org. Halloween Spooktacular at CHOM: Oct. 18, 5:30-7:30 p.m. Children’s Hands-On Museum of Tuscaloosa, downtown Tuscaloosa. Your costume and a food bank item are your admission. Tickets available to play carnival games for prizes. All ages with adult. For more information, visit chomonline.org. Chris Stapleton with Marty Stuart and Brent Cobb: Oct. 18, 7 p.m. Tuscaloosa Amphitheater. For more information, visit Ticketmaster.com, call the Tuscaloosa Amphitheater Box Office at (205) 248-5280 or charge by phone at (800) 745-3000. Theatre Tuscaloosa Presents “God of Carnage”: Oct. 19-28. Bean-Brown Theatre, Tuscaloosa. In this 2009 Tony-award winner, a playground altercation between 11-year-old boys brings together two sets of Brooklyn parents for a meeting to resolve the matter. For show times and more information, including tickets, call 205-3912277 or visit theatretusc.com. Sawyerville 8th Annual 5K: Oct. 20, 8 a.m. (registration); 9 a.m. (race time). St. Paul’s Episcopal Church, Greensboro. This Tuscaloosa Track Club certified, Grand Prix event raises funds for the Sawyerville, which includes summer camp, summer learning, mentoring, scholarships, and more. For more information, visit sawyerville.org. American Cancer Society’s Making Strides Against Breast Cancer Tuscaloosa Walk: Oct. 20, 8:45 a.m. (registration 7 a.m.), Tuscaloosa Amphitheater, downtown Tuscaloosa. This event raises funds for groundbreaking breast cancer research, life-saving education, and critical patient services. For more information, visit makingstrideswalk.org/tuscaloosaal or email TuscaloosaALStrides@cancer.org. 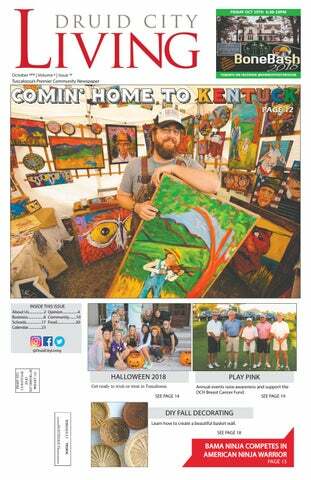 47th Annual Kentuck Festival of the Arts: Oct. 20-21, 9 a.m.-5 p.m. Kentuck Park, Northport. Hundreds of artists will exhibit works, along with demonstrations, music, food, and more. Single day tickets: $10; weekend passes: $15. Tickets can be purchased online, at the Kentuck Gallery Shop, or at the gate. For additional information, visit kentuck.org. The Human Body at CHOM: Oct. 20, 9 a.m.4:30 p.m. Children’s Hands-On Museum of Tuscaloosa (C.H.O.M. ), downtown Tuscaloosa. Creep on down to CHOM and enjoy learning all about the human body. Make your own x-ray and create a spinal cord! All activities included in admission. For more information, visit chomonline. org. Miracle League of Tuscaloosa Super Hero Day: Oct. 20 (games begin at 9 a.m.). LeeAnna Grace Cunningham Field, Sokol Park North. Local first responders will be at the games cheering on the players. Fire trucks, police cars, and even Sparky the Fire Dog will be there, too. For more information, visit miracleleagueoftuscaloosa.com. T-Town Witches Ride: Oct. 21, 4-7:30 p.m. Government Plaza, downtown Tuscaloosa. Witches will fly (well, they’ll ride bikes) through the streets of downtown Tuscaloosa to raise funds for The Arc of Tuscaloosa County, Inc. Enjoy awards, entertainment, food and beverages, a kid zone, and raﬄe prices. Entry: $25; participants must be 18 and over and dressed as a witch. For more information, visit thearcoftuscaloosa.org. Community Service Programs of West Alabama (CSP) Housing Resource Center is celebrating the 40th Anniversary of NeighborWorks® America through expansive planning in financial capability programming. You may not know that CSP is a member of the national NeighborWorks® network. Over the past 40 years, NeighborWorks® and its network have assisted close to 8 million people through affordable housing and counseling. What is Financial Capability? Financial Capability programming p is all about helping equip individuals and families with the tools and resources needed to navigate financial life events. NeighborWorks® in its 2018 Consumer Finance Survey discovered more than one-third (36 percent) of families with household income below $75,000 do not have both a checking and savings account with a bank or credit union. The survey further mentions, 38 percent of all households with incomes below $75,000 have no money saved for an emergency; and of those households with savings, 43 percent said savings would last one month or less. Helping individuals and families establish and sustain an emergency savings account, budget for important purchases and plan for retirement are some components of financial capability programming. CSP promotes and supports an approach that combines financial education (to share basic skills and knowledge), financial counseling (to resolve specific issues and challenges in the short term) and financial coaching (to encourage behavior change and achieve positive and sustainable long-term outcomes). For more information on financial capability programming, please call (205) 469-0358. NeighborWorks® America, formally the Neighborhood Reinvestment Corp., is a national, nonpartisan, nonprofit leader in affordable housing and community development. For 40 years, the organization has worked to create opportunities for people to live in affordable homes, both rented and owned; improve their lives; and strengthen their communities. This mission is accomplished through a network of nearly 250 nonprofit organizations in all 50 states, D.C. and Puerto Rico.